Please check THIS LINK to know how to perform aadi 18 pooja ( Pathinettam perukku in Tamil) at home in detail along with celebration pictures. Please check THIS LINK to know how to celebrate aadi 18 at home in detail along with celebration pictures. 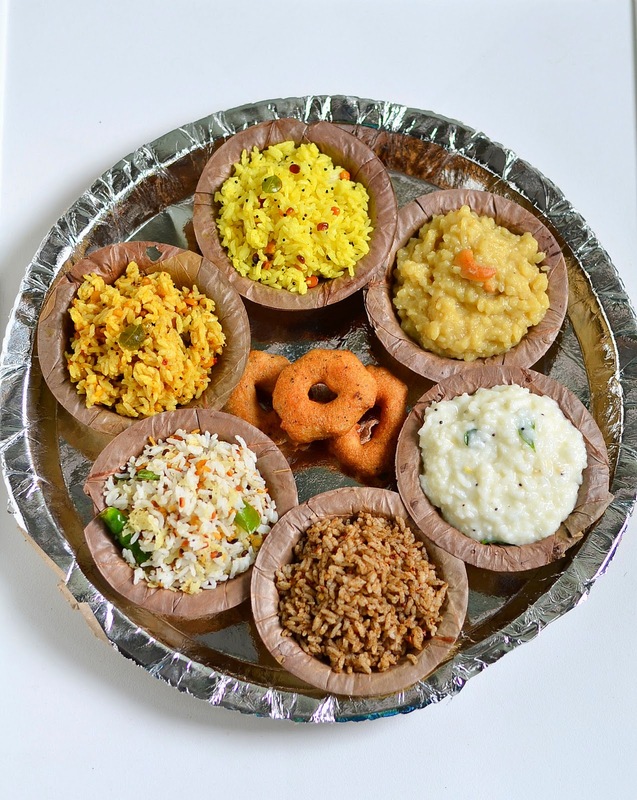 Every year we prepare Lemon rice or tamarind rice , Coconut rice, sweet pongal, sesame seeds rice, curd rice. Sometimes we make payasam with jaggery instead of sweet pongal and make Ellu sadam or milagu jeeraga sadham to make a count of 5. I have made a video on "How to cook 5 rice varieties for Aadi 18". I hope beginners would find it helpful. Please scroll through to check the video. Some people also make kalkandu sadam instead of sweet pongal. My mom used to say we have to make 18 rice dishes for aadi 18 ;) . But I don’t know how far it is true ;). Please watch the above video to cook this menu easily. In this video, I have shared how to cook 5 rice varieties for aadi 18 easily within 1 hour. I have shown making lemon rice, coconut rice, sesame seeds rice, curd rice and sweet pongal. If you wish, you can make tamarind rice instead of lemon rice. Please check the video below for tamarind rice. Usually we cook this lunch menu on (Aadi 18) festival day as we are doing the pooja only in the afternoon. We get lots of time in hand to cook this menu. We don't do any pre-preparations. Some people like working women or busy moms may like to do the pooja in the morning. For this, pre-preparations is essential.So I have shared the same below. 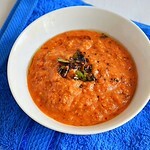 On the previous day afternoon or night, soak the urad dal for making vada. Add enough water to soak the dal and refigerate it for soaking.Do not freeze it. Use the same soaked water for grinding the vada batter in mixie. You will get great results. 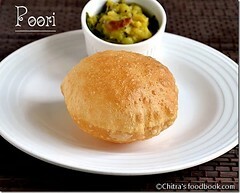 Please check the Urad dal vada link below for more details. Start to make pulikachal paste for puliodharai. 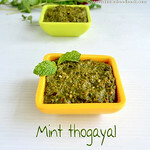 You can make this paste even before 2 days as it stays good upto 15 days under refrigeration. Store in an air tight box after the paste cools down and keep in refigerator till use. Do not use it for your regular cooking as its meant for neivedyam. 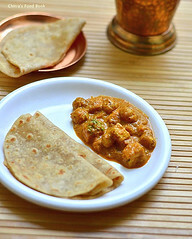 I have shared my MIL's puliodharai recipe link below. It tastes great just like kovil puliodharai. Do give a try ! 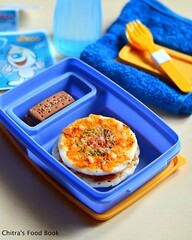 After doing the pulikachal paste, prepare the lemon rice paste and store in a box. Its not necessary to make both lemon rice & tamarind rice. Any one is fine as both tastes tangy. Prepare ellu podi for sesame seeds rice by dry roasting sesame seeds & red chilli. Grind to a fine powder and store it. You can also make Milagu jeeraga sadam/ Pepper cumin rice instead of sesame seeds rice. 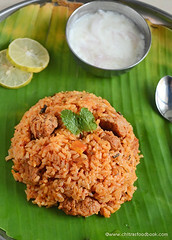 Please check the links for lemon rice & travel lunch recipes for Ellu sadam, milagu jeeraga sadam. Then you can prepare the coconut rice mix. Don't worry, it won't spoil as we are roasting coconut along with the other ingredients. Refrigerate it in a box. Do the tempering for curd rice and refrigerate it. Roast the moong dal in ghee for sweet pongal and keep aside. Melt the jaggery for sweet pongal adding required water, strain it and keep the jaggery syrup in an air tight box. No need to refrigerate it. I use 1:2 ratio of water and jaggery. The next day morning, take bath and remove all the stored boxes. Let it come to room temperature. Start to prepare for neivedyam by cooking the rice. If you are cooking for 2 to 3 people, use 2 pressure cookers. In one cooker, add 1 cup raw rice, 2.5 cups of water. Add few drops of cooking oil in the water and cook in very low flame for 1 whistle. Use this for making lemon rice or tamarind rice, coconut rice, sesame seeds rice. In second cooker, take 1 cup raw rice. Keep a small box inside the cooker and add 2 tbsp roasted moong dal with 1/2 cup water. Add 5 cups of water to the rice and pressure cook in low flame for 1 whistle. Use this rice for making sweet pongal and curd rice. Both the rice gets done in 15 minutes simultaneously. While the rice is cooking, You can decorate the pooja room. As soon as the steam is released, open cooker 1. Take the rice from cooker 1 using a fork like ladle gently (Do not mash it). Spread it in the plate and add 2 tsp of sesame oil ( Nalla ennai). Let it cool down. Divide the rice in 3 plates for making rice varieties as per the quantity you need it. For my family, I make more puliodharai or lemon rice. I make very less thengai sadam and ellu sadam just 1/4 cup each. Open cooker 2 after steam is released. 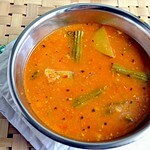 Remove the moong dal box from cooker 2 and mash the rice when hot.Use this rice for making curd rice and sweet pongal. Mash when the rice is hot else it will be difficult. After mashing the rice, divide into equal portions or as per the required quantity. To the curd rice part, add 1/2 cup of warm milk or water. Add salt and mix well. Add the curd + tempering. Mix well. Add fresh cream or butter if you like. Garnish with fruits like grapes and pomegranate or coriander leaves if desired. Take the mashed rice for sweet pongal and add the prepared jaggery syrup, cooked moong dal. Mix well and cook for a minute. Add ghee roasted cashews,cloves, cardamom powder, jathikkai powder and required ghee. Mix well. Now take the cooled rice and make lemon rice/ tamarind rice, coconut rice and sesame rice adding the prepared paste and powder. After making all these rice varieties, take the soaking urad dal from the fridge and grind using mixie. Add the soaked water for grinding.Do not add salt. Grind fluffy batter and remove in a bowl. Add coarsely ground pepper, cumin and few torn curry leaves. Add hing. Mix well. Heat oil to deep fry and make the vada. You can also fry some papad in the oil. Now we have cooked all th 5 rice varieties, sweet pongal, vada and everything is ready for neivedyam. All these hardly takes 45 minutes if you have prepared all the paste on the previous day. If you are making everything on the same day, it takes around 1.5 hours. Make it as per your convenience and celebrate this festival in a grand manner at home. Get the blessings of GOD. 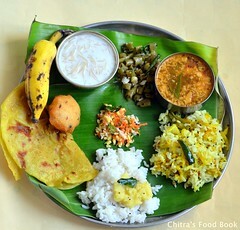 Beautiful platter Chitra; it evokes monsoon in TN so well! 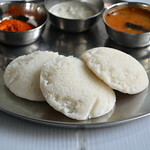 Deliicous Aadi perukku recipes. Looks yumm. Very nice celebration meal dear. 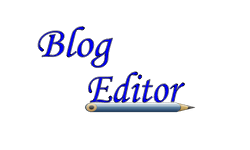 Love the way you wrote the post and clicks too. Wow 5 variety rices looks very nice along with sweet and vadai. 18 rice varieties .... surely tells the heritage of Indian tradition!